There are many species of the genus Liatris. They are great nectar sources for attracting butterflies. 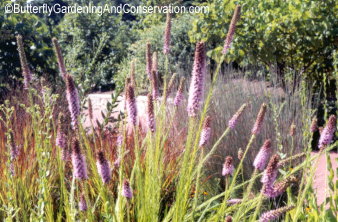 Liatris grows to 2 to 5 feet and blooms from July to October. Loves full sun. Liatris pycnostachya can usually only be found at native plant nurseries, but Liatris spicata is very similiar and many places sell it. Common names for liatris species include Blazing Star and Spike Gayfeather. A good online store is Nature Hills Nursery. Their perennials cost a bit more but they are grown in 4'' x 6'' air-pruned pots that results in healthier plants with a highly developed root mass! The price is reduced however, if you buy more plants. Nature Hills also has a free plant and seed catalog that they will mail out to you. You can buy it from their site here: Nature Hills Nursery site or read more detailed information about this plant or see more detailed pricing information. Or order by calling 1-888-864-7663 using the Source ID: 86642! Liatris is not easy to grow from seed. I bought some seeds once and they are not easy to germinate and usually don't bloom until the second year. I highly recommend buying the plants instead. If you do decide to buy or collect seeds to grow your own - don't cover the seeds when planting them, they need direct light to germinate.